For other uses, see Kayan. The Kayan are a sub-group of Red Karen (Karenni people), Tibeto-Burman ethnic minority of Myanmar (Burma). The Kayan consists of the following groups: Kayan Lahwi (also called Padaung, ပဒေါင်[bədàʊɴ]), Kayan Ka Khaung (Gekho), Kayan Lahta, Kayan Ka Ngan. Kayan Gebar, Kayan Kakhi and, sometimes, Bwe people (Kayaw). In the late 1980s and early 1990s due to conflict with the military regime in Myanmar, many Kayan tribes fled to the Thai border area. Among the refugee camps set up there was a Long Neck section, which became a tourist site, self-sufficient on tourist revenue and not needing financial assistance. According to U Aung Roe (1993:21ss) Kayan number about 40,000 in Shan State (around the Pekon Township area) and 20,000 in Kayah State (around Demawso and Loikaw). A 2004 estimate puts the population at approximately 130,000. About 600 Kayan reside in the three villages open to tourists in Mae Hong Sorn, or in the Ban Mai Nai Soy refugee camp. According to Kayan tradition the Kayan settled in the Demawso area of Karenni State (Kayah State) in 739 AD. Today, they reside in Karenni (Kayah) State around Demawso and Loikow, in the southern region of Shan State and in Mandalay’s Pyinmana and Karen’s Than Daung township. There are three Kayan villages in Mae Hong Son province in Thailand. The largest is Huay Pu Keng, on the Pai river, close to the Thai Myanmar border. Huai Seau Tao is a commercial village opened in 1995. Many of the residents of Ban Nai Soi Kayan Longneck village moved into the Karenni refugee camp in September 2008, but 20 families and 104 residents remain there, according to the sign at the entrance as of February 201. Women of the Kayan tribes identify themselves by their forms of dress. 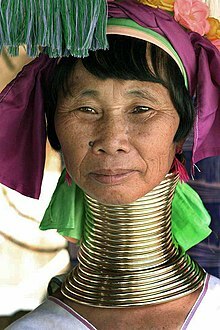 Women of the Kayan Lahwi tribe are well known for wearing neck rings, brass coils that are placed around the neck, appearing to lengthen it. Girls first start to wear rings when they are around 5 years old. Over the years, the coil is replaced by a longer one and more turns are added. The weight of the brass pushes the collar bone down and compresses the rib cage. The neck itself is not lengthened; the appearance of a stretched neck is created by the deformation of the clavicle. Many ideas regarding why the coils are worn have been suggested. Speculation by anthropologists, who have hypothesized, that the rings protected women from becoming slaves; making them less attractive to other tribes. It has also been theorised that the coils originate from the desire to look more attractive by exaggerating sexual dimorphism, as women have more slender necks than men. It has also been suggested that the coils give the women resemblance to a dragon, an important figure in Kayan folklore. The coils might be meant to protect from tiger bites, perhaps literally, but probably symbolically. Kayan women, when asked, acknowledge these ideas, and often say that their purpose for wearing the rings is cultural identity (one associated with beauty). The coil, once on, is seldom removed, as the coiling and uncoiling is a lengthy procedure. It is usually only removed to be replaced by a new or longer coil. The muscles covered by the coil become weakened. Many women have removed the rings for medical examinations. Most women prefer to wear the rings once their clavicle has been lowered, as the area of the neck and collarbone often becomes bruised and discolored. Additionally, the collar feels like an integral part of the body after ten or more years of continuous wear. In 2006, some of the younger women in Mae Hong Son started to remove their rings, either to give them the opportunity to continue their education or in protest against the exploitation of their culture and the restrictions that came with it. In late 2008, most of the young women who entered the refugee camp removed their rings. One woman who had worn the rings for over 40 years removed them. After removing the rings, women report discomfort that fades after about three days. The discoloration is more persistent. The government of Myanmar began discouraging neck rings as it struggled to appear more modern to the developed world. Consequently, many women in Myanmar began breaking the tradition, though a few older women and some of the younger girls in remote villages continued to wear rings. In Thailand, the practice has gained popularity in recent years, because it draws tourists who bring revenue to the tribe and to the local businessmen who run the villages and collect an entry fee of 500 to 600 baht per person. The Karenni National People's Liberation Front (KNPLF), an armed cease-fire group, have made attempts to invite the Kayan to return to Kayah State to set up their own tourist villages. In January 2008, the UNHCR expressed reservations about tourists visiting the Kayan villages in Northern Thailand due to the provincial government’s refusal to allow registered Kayan refugees to take up offers of resettlement in developed countries. It is believed this policy was linked to their economic importance to the area. This policy was relaxed in late 2008 and a small group of Kayan have left for New Zealand in August 2008. Others entered the main Karenni refugee camp (which is not open to tourists) in September 2008 and they are now eligible for resettlement. In the past the choice of marriage partners was usually the responsibility of the parents; but today young people often select their own partner. The rule of marriage is only those genetically related are allowed to marry. It is preferable for first cousins to get married. However, marriage between different generations is taboo. Marriages with in-laws or conflicting clans who have sworn not to marry for several generations is forbidden. It is believed that if these rules are violated the misfortune falls upon all their relatives. the talio which is divided up among the closest relatives, and consists for the most part of utensils, mats, household goods etc. the tiki or little gift of money given to the bride before they are united. Following the pwai dance the women sprinkle the men with water using eugenia leaves. The Kayans’ traditional religion is called Kan Khwan, and has been practiced since the people migrated from Mongolia during the Bronze Age. It includes the belief that the Kayan people are the result of a union between a female dragon and a male human/angel hybrid. The major religious festival is the three-day Kay Htein Bo festival, which commemorates the belief that the creator god gave form to the world by planting a small post in the ground. During this festival, held in late March or early April, a Kay Htoe Boe pole is erected and participants dance around the pole. This festival is held to venerate the eternal god and creator messengers, to give thanks for blessings during the year, to appeal for forgiveness, and pray for rain. It is also an opportunity for Kayan from different villages to come together to maintain the solidarity of the tribe. The Kayan have a strong belief in augury and nothing is done without reference to some form of divination, including breaking thatch grass, but most importantly consulting the chicken bones. In present times, the annual Kay Htein Bo festival is always accompanied by a reading of the chicken bones to predict the year ahead. Fowl bone prognostication can be witnessed in the Kayan villages in Thailand’s Mae Hong Son province during the annual festival, and during “cleansing ceremonies” that a family holds when it has encountered ill fortune. They also use dreams to make predictions. Although many of the Kayan still participate in these traditional festivals, in the 19th Century Italian missionaries worked amongst them for many years and today the majority of Kayan and Kayaw people are Roman Catholics. Statistics published in 2005 list 306 Kayan villages, out of which 209 are Roman Catholic, 19 Kan Khwan, 32 Baptist, and 44 Buddhist, of which 2 belong to the Byamaso civil society organization. Ndebele people of South Africa - An African tribe with a similar practice. The Kayan of Borneo share the name but are not related and do not have the same customs. ^ a b "Religion". Huay Pu Keng. Retrieved 2013-08-04. ^ Virtua Design. "The Dragon Mothers Polish their Metal Coils by Edith Mirante - Guernica / A Magazine of Art & Politics". Guernicamag.com. Archived from the original on 2008-12-12. Retrieved 2013-08-04. ^ "Les peuples oubliés". Blogg.org. 2007-08-26. Retrieved 2013-08-04. Wikimedia Commons has media related to Kayan (Burma). Hostage to Tourism Article by Edith T. Mirante. Need to create account to view article.